While Julia and Nicholas were at camp not so long ago, Elliott and I had the week together. It was a wonderful week for the two of us. I sometimes think that despite the joy and togetherness of our pack mentality during the summer, when we are all together, the youngest can sometimes get a bit overwhelmed by the energy, the play, and the expectations to interact at level that is a bit more mature than the one where he prefers to operate. As we try to find a balance that works for all three of them, he has to jog along to keep up with the natural pace of his older siblings. And so this week gave us five days to move at the pace of a six year old. To do exactly what he wanted to do. And time together, just the two of us, to reconnect and sit quietly together. We had a few visits with friends and worked in some time in the garden. We read together and he tagged along on some necessary errands. But what we both enjoyed most were the things we did together that were inspired just by Elliott. We went to the library and took out a bag of books just for him. One book I found and showed to him in the library he plunged enthusiastically into our bag, a title that I had read a review of and was hoping to find for him: Bluebird, by Bob Staake. Elliott loved this book, though its ending left him feeling sad. But the boy in this book, befriended by an animal, won us over. Developing a connected relationship with a bird, the connection that Elliott seems to forge with creatures of all kinds, both real and imagined. In a book without words. Though Elliott can read, he prefers to be read to, or when he reads alone, he looks at the pictures. His favorite books are the ones that allow him to tell the story to himself by looking at the pictures. He notices everything in the illustrations, making inferences and deductions based on facial expressions, small details, omissions from page to page. Bluebird was a book that was just right for him. We read it and then I closed it and I was looking at the cover. I was thinking about the ending and whether I needed to talk a bit to see how he was making sense of it or just let the ending's uncertainness be, whether he had interpreted it as a happy end or as something different. As I looked at the cover, he said: This author. He wrote another book. The one with all the pictures and the animals? The Look Book? The people. They are drawn the same. I had not remembered this. Sure enough, we did a quick search and Staake had authored another visually packed book that I had chosen a few weeks before from the library: Look! A Book!. Elliott's visual understanding and the connections he draws constantly surprise me. 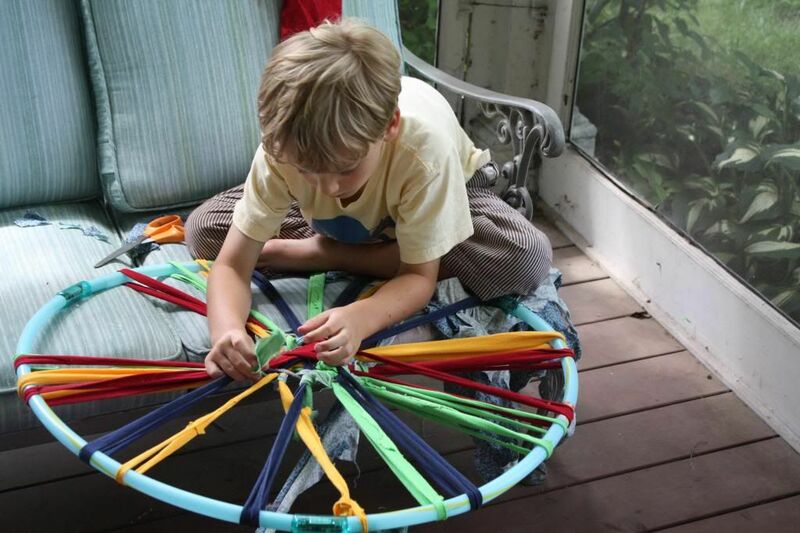 We also had some time, to sit on the porch and, inspired by Julia, make a hoop rug of our own, Elliott was able to choose the fabrics completely on his own. 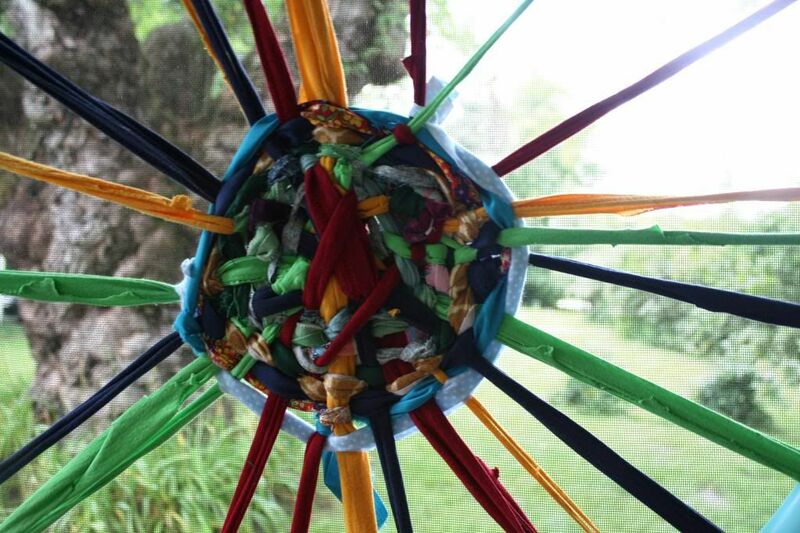 We sat together for hours, weaving and talking. He worked in fabrics of animal prints and cloth that he said look like nature, and he carefully pulled back adjacent fabrics to make sure you could really see the prints on these fabrics. That their details did not get overcrowded or lost behind another piece with a more vibrant color or a denser weave. Knowing his love for all things animal, our one paid for adventure for the week was to the Maine Wildlife Park, a long time family favorite, but sadly one that our older two children no longer always jump at the chance to visit, though Elliott still finds it to be a just right adventure. This park, run by the Maine Forestry Service and offering care and shelter to animals that have been injured, is also like a zoo for Maine animals with an eye toward education, conservation, and wildlife protection. While there, we visited all of our favorites, spotting deer in the woods, measuring tree diameters, and the long time resident bears and white groundhog and white raccoon, unable to live in the wild because their coloring will make it hard for them to hide from predators. But our favorite animal exhibit that day was in the bird area, where we found a peregrine falcon. This falcon had injured his wing, and was trembling a bit and trying to fly. He was walking around his enclosure, hopping about on the perches that had been constructed with a mind toward being able to hop, rather than fly, from one level to another. Though we did not find a ranger to ask about the story of the falcon and how he came to be injured, Elliott and I visited him three times while there, the last time just standing quietly and watching him. And so without his story, without words, we needed to make meaning for him on our own. He must have just hurt himself. He doesn't seem to know he can't fly. He keeps trying and trying. Flapping hard. He seems confused that nothing is happening. Elliott had amazing compassion for this injured animal. He was watching and observing the bird through the fencing. While I was watching and admiring Elliott. 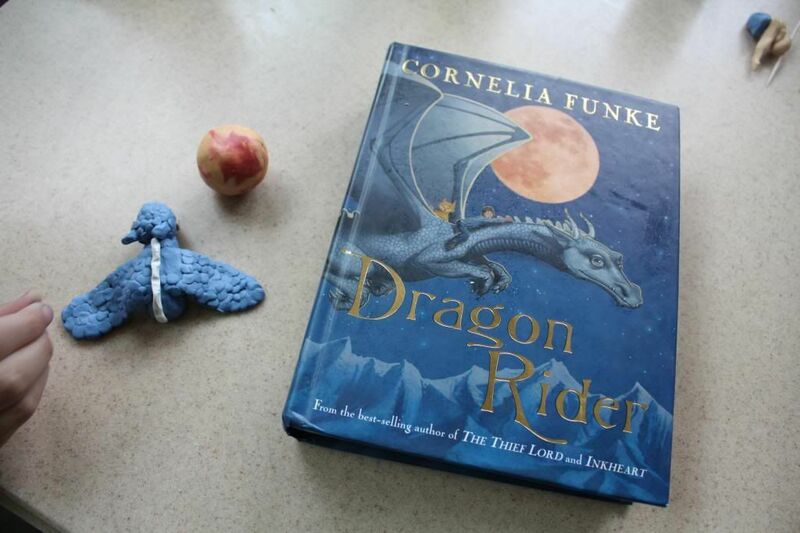 Our backdrop for the week, the overarching story, was Dragon Rider, by Cornelia Funke, which we had borrowed as an audiobook from the library. We have all listened to this story several times, so many times that Nicholas and Julia have not voted for it more recently when deciding together on an all family audio book choice. But this week, Elliott and I listened to the whole book together, as we drove Nicholas and Julia to camps, and he and I to play dates and adventures. As he drew while I loaded dishes or did the laundry. Elliott loves this story. Of a single human boy winning the trust and friendship of a dragon and then many more creatures. Of the dragon world needing to move from their valley home, threatened to be destroyed by humans. Of Ben, the human boy who is wide eyed and full of wonder when he first meets the dragons. But not afraid. The human child who can connect with creatures, feel empathy and love for them, see the human's role in their problems, and want to help. This is Elliott. And why he connects with this book. Several mornings, after our early morning drives to the ferry station and then to Julia's art camp, we returned home, the day together stretching ahead of us. We listened to the story as we drove. As we would drive into the driveway Elliott would ask, Can we listen to the story just a little bit more? Just a few more chapters? I would look at the time. At the welcoming green yard with bugs and a garden and chickens and dogs to frolic with. And think about ideas I had for activities for us to do together. And say Sure. Want to climb into the front seat with me? And he would. And we would sit there in the driveway, side by side. For a very long time. And listen to the story. Rain showers and hours passed by as we did this sometimes. And I would have the chance to really listen to the story in ways that I usually cannot as I focus on driving or think about something pressing on my mind on our drives, or move in and out of the room at home where the story is playing as I clean or make a meal. Now, for the first time, I listened to parts of the story that I know had been playing when I was in the room or the car, but that I had never heard. Eventually, usually due to hunger or the need for the bathroom, Elliott would ask to stop listening and go inside. And then the story would continue though we left the audio book behind in the car, in the way that is so representative of the way Elliott works through his world and his thoughts. Elliott has translated many of this story's creatures into pictures. We have a stuffed Firedrake, the dragon, drawn by him, then cut out in felt and stuffed with beans. 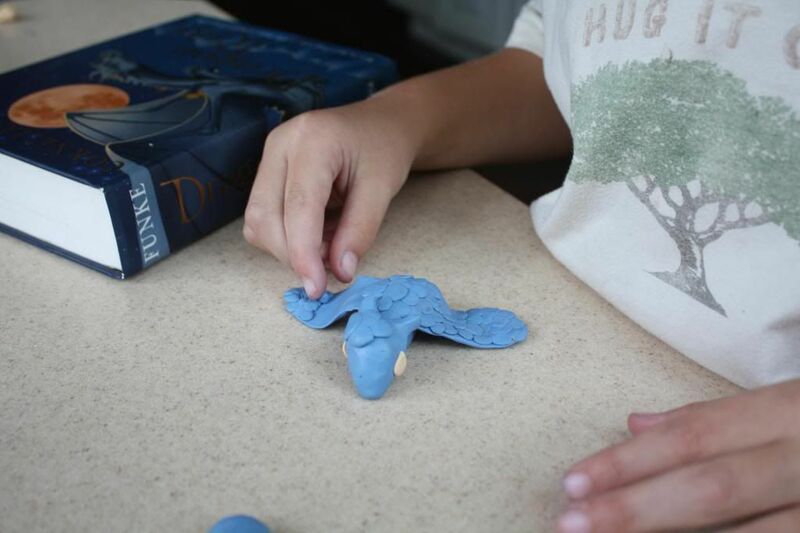 Last year Elliott made a tiny clay Firedrake and even smaller clay sculptures of the creatures and human boy upon the dragon's back. I was amazed then by his ability to work with clay on such minute figures. His dexterity. Eyes the size of poppy seeds. Visual details worked in the small. And so, this day, I watched Elliott head for the art closet and come out with his collection of Sculpey, his favorite clay to work with. This time it was still about the details, the visual details. We made a moon, carefully getting a color that was not so bright that it looked like the sun. And talked about how to smudge in the red blotches to give it texture but not look like islands. We talked about its proportions. If we made it hollow, it could be bigger, without having to use more Sculpey, he suggested. We sat together while he combined colors until he had just the right blue...not too bright, but not so gray that he doesn't seem friendly. We worked on Elliott's signature large and round eyeballs. 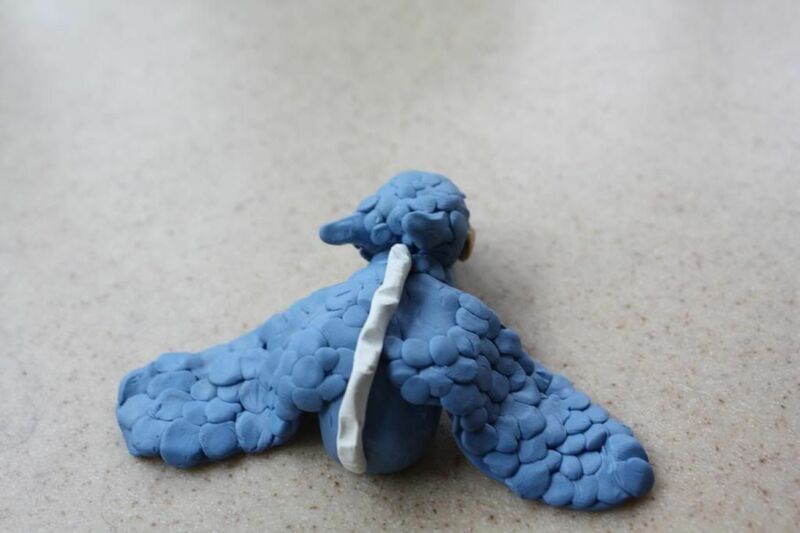 On the shapes of the wings and how to support them so the dragon looked midflight. And then? Scales. Only in a week of leisurely Elliott pace could we pinch a small bit of the perfect firedrake blue, roll it in our finger tips, and then press it to the dragon, covering his entire body with scales. Carefully. Quietly. Lovingly. As we were leaving the wildlife park, Elliott had turned to me to say, The falcon. He is so pretty and small. I wish I could go inside with him and hold him. And hold him in the air so he could feel like he is flying. This boy. The falcon. His dragon. And the world as they see it. At their pace.